Fender Passport Series portable PA systems have been in production for quite some time and have undergone numerous refinements. 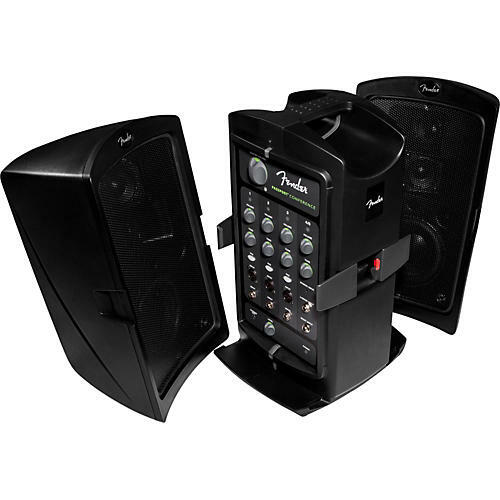 The current version, the Fender CONFERENCE, is the most features-rich version ever produced and reflects the best value yet in easy-to-move sound reinforcement in a middle-sized offering. The Fender Passport CONFERENCE is a self-contained portable audio system that includes everything you need for great sound anywhere you go. Providing extremely easy operation, the Passport CONFERENCE is perfect for the layperson who needs quality with simple functionality. Carry your Passport as you would a suitcase, and simply flip open the cabinet release latches when you're ready to set it up. Inside you'll discover two full-range speaker cabinets, a powered mixer and all the cables you'll need to get started.